An Outdoor iPod Music Solution! 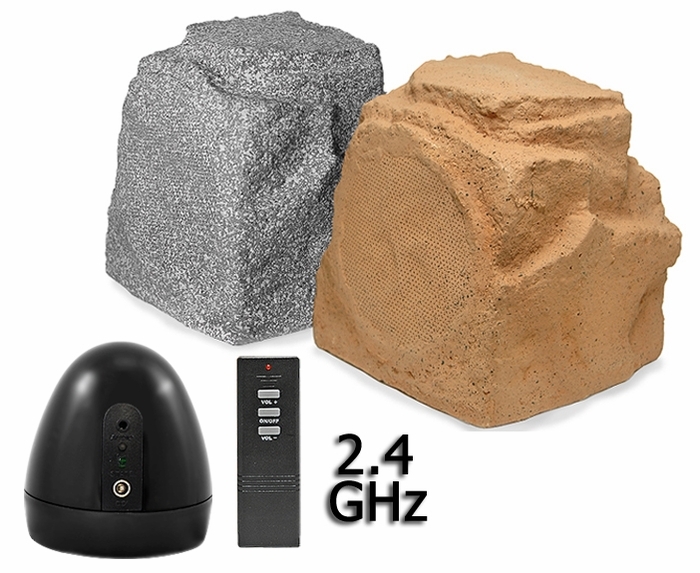 Using the more reliable 2.4GHz digital frequency, the all-weather WR150 wireless rock speakers send quality sound up to 300 feet (may vary depending on the environment). Two 5” polypropylene drivers provide excellent sound while all-weather construction ensures a long life. If you've been looking for a no-hassle way to listen to your music library outside, this is it. Just plug your music source (iPod, MP3 player, computer, etc) into the wireless transmitter (RCA and mini audio cables included), run the speakers where you want them and you'll be listening to your favorite tunes in the back yard or patio. Installation Ability Level: Novice Even if you have very little AV knowledge, this wireless system is easy to set up. The system uses a main speaker that includes an amplifier for power. The second speaker is a pairing speaker, meaning it draws power from the main speaker. Connect the audio source (iPod, receiver, etc) to the transmitter via the provided audio cable. Plug the transmitter into an AC outlet via the included AC power supply. Plug the main speaker to an outdoor junction box or load the main speaker with 6 AA batteries (not included). Place your rock speakers where you want them. You may have to experiment with frequency channels and speaker placement to achieve the best sound. 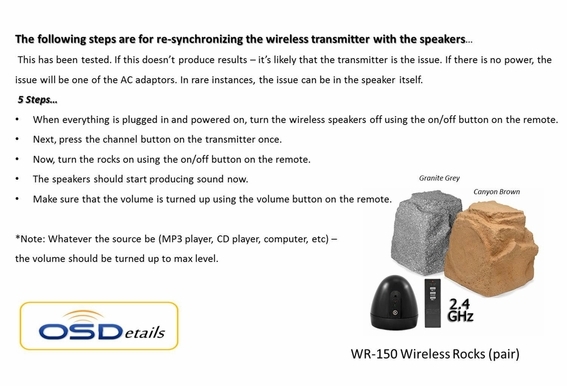 Wireless refers to the fact that you do not need to connect the rock speakers to your audio source. The two speakers are connected via speaker wire. The reason for this is that an amplifier is built into a main speaker which acts as the power source for both speakers. 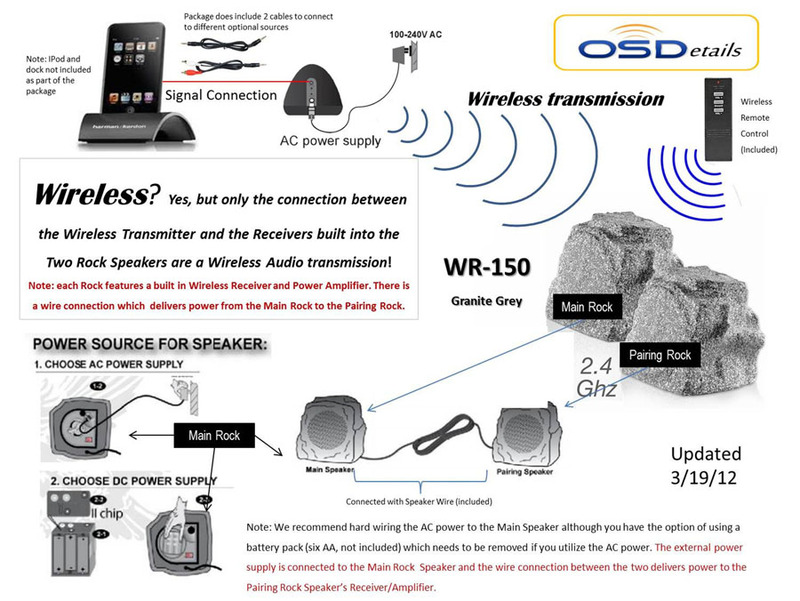 This is why the rock speakers must be wired together. Speaker Dimensions: (LxWxH) 7" x 7" x 7 1/2"
Question: Can I Add More Speakers? Speaker Dimension:(LxWxH) 7" x 7" x 7 1/2"
Finishes in Granite White, Granite Grey, and Canyon Brown. Using 2.4GHz digital technology vs the weaker old technology analog 900Hz technology. The 2.4Ghz has longer range, less noise and interference. 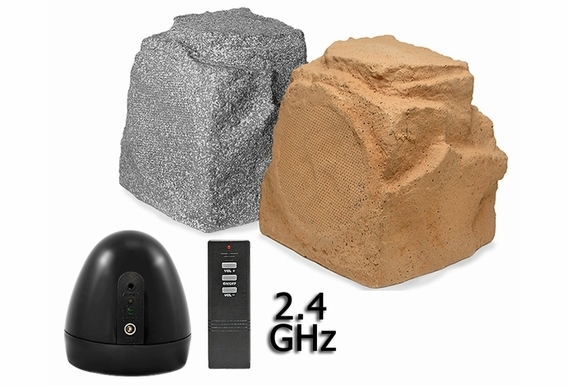 Weatherproof designed wireless rock speakers. Send quality sound up to 300 feet range unobstructed (may vary depending on the environment) through walls floors or ceilings. Remote control included. I've lost the manual that came with the WR-150 speakers. How can I get one? The pdf file on your website is not working. My remote was broken can I use a universal remote to turn it on? Where can I get another remote? Hi Travis, You will need to purchase another remote through our website. Can I use my smart phone to send the music to these speakers? Samsung Galaxy 3. Are these stereo speakers or 2 mono speakers? Could I connect the base unit too an airport express and use the 3.5mm jack as the source and then play Spotify or iTunes radio? I have a Netgear R6300 Wireless AC router in my basement. It is a small raised ranch. It operates at 2.5 and 5 gHz. I plan on putting the tranmitter upsrtairs next to my receiver which is about 20 ft hoirizontal distance and maybe 10 ft verticle distance from the router. Do you think I will get interference problems? Can you connect multiple pairs of speakers around the yard? Say, two on the left side of a yard, two in back, and two on the right side of yard for a total of six speakers paired with main speaker? What is the transmitting range for these speakers? The speakers produce music for up to 300 ft...but how far can I set the receiving speakers away from the transmitter? I have tried to use my ipod as a source and I get nothing. I have tried cycling through the channles as discribed in the youtube video bt still nothing. the only source I have been able to make work i using my direct tv box a the source vi the RCA cable. Any suggestions. I just got these speakers and follow the set up instructions. The green light is lite on the base when you turn the switch on. Does the red light stay on when you push the button on the remote to power unit up? It comes on for a brief second only. My speakers do not work and I think they are not powering up. Thanks for any input on these speakers. Thank you! I'm interested in these speaks but concerned that they might be "distance limited." I want to place them around my pool, was hoping to extend the speakers beyond the 30 ft distance allowed by the provided cable, but noticed in another response this is not recommended as the stereo effect is lost. Can you tell me the distance of the a/c power supply? I don't want to have rock #1 close to the house/patio outlet (a/c power source) and rock #2 a mere 30 ft away as this option isn't really the location in our yard/pool where we "hang out." Options? Thanks. Can the transmitter be plugged into a bluetooth soundbar? How long is the wire between the 2 speakers? Is there any extension if I want to place one on either side of my pool and the length of the wire provided is too short? Can you use your iPhone to play music too? What is the return policy/process for these? I've not had wireless outdoor speakers before and want to try them out, but if they do not work I want to be able to return them. 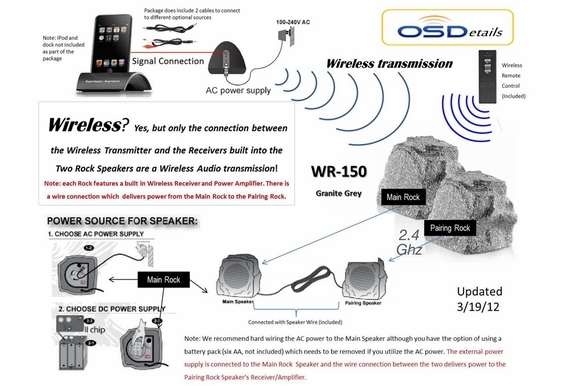 I have a pair of wired rock speakers and was wondering if I can add 2 wireless to the system. Thought it would be easier than running the wire. I have a pair of your wireless rock speakers that I bought about 2 months ago. The problem is that when the transmitter is powered up, it totally blocks my wifi router (Wireless N/G mixed) signal. Is there a physical or electronic way to ensure that these two components can work in the same room without interference? I have been using them for year with no problem but recently, my remote will not turn system on. New battery installed as well as double checking that all power was on but no response.. I purchased these speakers March 2011, one season worked great. Stored in the house over the winter. I find the AC adapter is not working (Part number HG1L090080) is there a replacement? Was ready to order a second set to synch to the two I have but will see if I can get a new AC adapter for the original or if there is some warranty on the part. Using batteries as the power source but rather AC power. Trying to hook these up to my Yamaha RX-V1400 AV receiver and not having success. Works great with the mini jack into my iPhone but output with the RCA plugs is very low. RCA plugs are plugged into the preout jacks of the receiver. What am I missing? Thanks in Advance! The speakers sound ok but I get some interruption once in awhile, my sending unit is in the house and speakers are outside but line off site is through windows and about 40 ft. do you have any suggestions as what I can do? I bought these speakers last year and they worked. I am trying to set them up this year and they aren't working. I tried syncing the speakers to the transmitter, but can't get the remote to turn the speakers off. Any ideas? Is it possible to purchase just a speaker AC cord for this Wireless indoor Outdoor Speaker Pair? If you buy two speakers, how far apart can they be from each other. Do they have to be side by side? 1. What is the length of the speaker AC adapter wire? 2. What is the length of the pairing speaker wire? 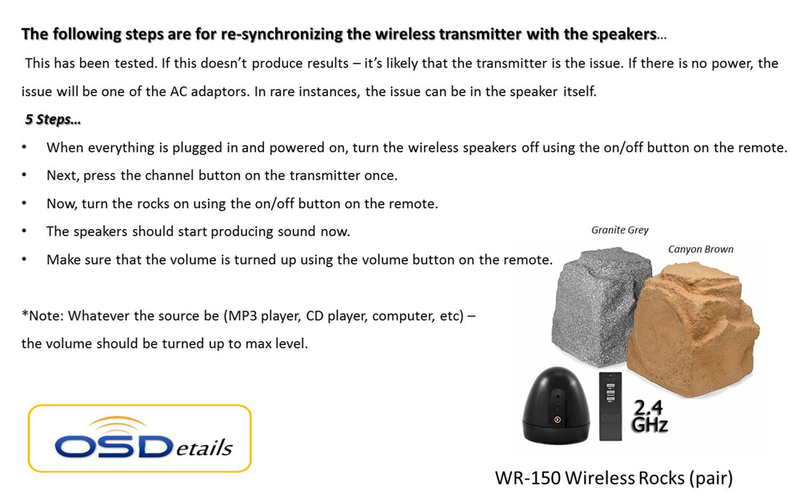 Can the WR 150 2.4ghz Wireless Outdoor speakers be hooked up to a projector for DVD capabilities for an outdoor movie? can u buy 2 sets and wire them together? Can the transmitter be powered by battery or does it only work with when plugged in? How compatable is this wireless speaker system with other units like a table top radio? how loud does the speakers get? Can you easily hear the sounds in the yard? It is hard to gauge how loud these will get in an open air enviroment espeially not knowing how big an area you will be placing these speakers. Note these produce 50 watts peak. If loudness is really a concern you can purchase a second pair and feature two pair or four speakers. Or you can select or WR-800 which features a 8" mid bass driver versus the 5.25" of the WR-150. It not only features more cone space but have an amplifier with peak of 120 watts, more than double the WR-150. Can i purchase them at any of the warehouse or large chain stores? It use 2.4g wireless technology.